Collingswood Roofing Contractor: Tips for Choosing the Best Contractor - Tortorice Contractors Inc.
Roofs help to protect us from the heat of the sun and the cold of winter nights. Having a leaky roof can be problematic because it can be expensive to replace and DIY-ing it can be dangerous. Choosing the right Collingswood roofing contractor to do the job seems easy enough, after all there are so many of them listed in the yellow pages. However, not all roofing companies in Collingswood are created equal. Some of them can do a better job compared to the others. 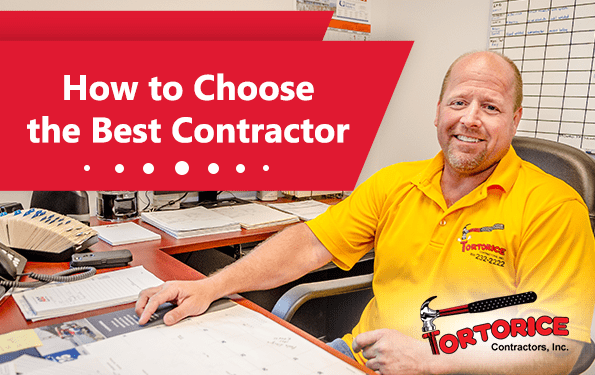 Here are some tips to help you see if the contractor you have in mind is right for your job. Roofing is a very dangerous job. Mistakes can cause injuries to people and damage to your property. Before hiring any contractor, make sure that they have workers’ compensation and liability insurance. This is not only to protect the company but also the employees who are working on your property. A good roofing firm based in Collingswood should have both types of insurance. If their employees have an accident while working on your roof, you could be liable for any injury to the worker that occurs on your property. This is also true for any damage that occurs to your property. If the Collingswood roofing contractor does not have insurance, they will not be able to pay you for the damages and you are left to pay for the damages caused to your house. There are many roofing companies located within the state. However, it is better to choose a company based in Collingswood. First of all, local contractors have a close relationship with the community. They have probably even done some work for people you know. Because of this, it is easy to ask them for feedback on past work they had done so you have an idea of how these companies work. Secondly, hiring local is always good for the local economy. Local companies are more likely to hire local people and provide them with jobs. Hiring contractors from an outside town can be a little risky. You don’t really know if these roofers are legitimate since they are most likely unaffiliated with the local business bureau. It is also harder to check their offices because they would be located a good distance from where you live. When you’re hiring a roofing company from Collingswood to fix your problem, don’t settle on the lowest price. Cheap prices are great but can they can also be a little suspicious. A reputable roofing firm will have overhead costs like insurance, salaries, and other expenses they need to cover which is why their prices are always going be higher than others. Hiring cheap contractors carries the risk of hiring people who are not highly trained for the job. Cheap contractors that do the job on the side are always tempting. But in the end, you always get what you paid for. Fixing a roof is a time-consuming effort that requires high-quality materials. This is why you need to hire a Collingswood roofing company that has a good reputation. Storm chasers are also known as the “we were in the neighborhood” contractors that usually offer much lower prices compared to other established roofing companies in Collingswood. They usually pressure homeowners into signing contracts because they won’t be in the neighborhood for long. Do not sign anything from these storm chasers and do not fall for their tactics. A good roofing company from Collingswood know that repairing a roof takes time. Professionals need to assess the roof before they know what needs fixing and how much it will cost. Wait for and see estimates before signing any contract. A professional Collingswood roofing firm knows what is involved in fixing a roof. They follow steps to know what needs to be done and they know how to do it right. Once they determine this, they will compute the costs and submit an estimate for your approval. Once it is approved, the roofing contractor will draft what needs to be done in detail. As a homeowner or property owner it is your job to make sure that everything that needs to be done is in the contract. The contract should also include a schedule so that you know how long the job will take. You should also have a clear idea of the size of the crew and an estimated date of completion. A professional Collingswood roofing contractor should put all of these details in your contract. Is the roofing contractor from Collingswood returning to your calls? Do they provide you with documentation? Is everything you need stated in the contract? If you answered no to any of these questions, make sure you tell your concerns to the company representative. Fixing a roof can involve procedures and language the layman cannot understand. This is why communication is important. A good roofing company from Collingswood knows how to communicate so that their clients understand the job. They should also be responsive to any questions and concerns the property owner has. Fixing a roof can cost a lot of money. It is better to vet prospective roofing contractors from Collingswood before hiring any of them to do the job. In the end, you have to trust your instincts and choose a contractor that fits your requirements and budget.